“Catfish” Collects $100K At SFG Super Bowl At The Rock! ROCKINGHAM – Saturday found more huge crowds at Rockingham Dragway as racers lined up for their shot at the massive SFG Promotions payouts at the Super Bowl of Drag Racing. 569 of the nation’s best big money bracket racers took their shot at the $100K winner’s payout on Saturday. As the racing continued well into the morning hours on Sunday, the semifinals included the dragsters of Kyle Cultrera and Cory Gulitti along with the doorcars of Jason Lynch and Jordan Wike. Cultrera and Gulitti squared off for the third straight round as both were double-entered and went deep in both entries. Gulitti won the tree, .009 to .023, but took .019-second at the stripe to go -.009 under handing the win and a trip to the $100K final to Cultrera who scrubbed just enough E.T. to go -.004 under in the double-breakout contest. On the doorcar side of the semi’s, Jason Lynch, already a runner-up in a $50K race earlier this summer, and his sweet S-10 pickup took on the 7-second second generation Trans Am driven by Jordan Wike. At the tree, Wike turned it -.001 red giving Lynch the free pass to the $100K final round. Lynch was solid once again at the tree posting a .012 light before coasting through the finish. 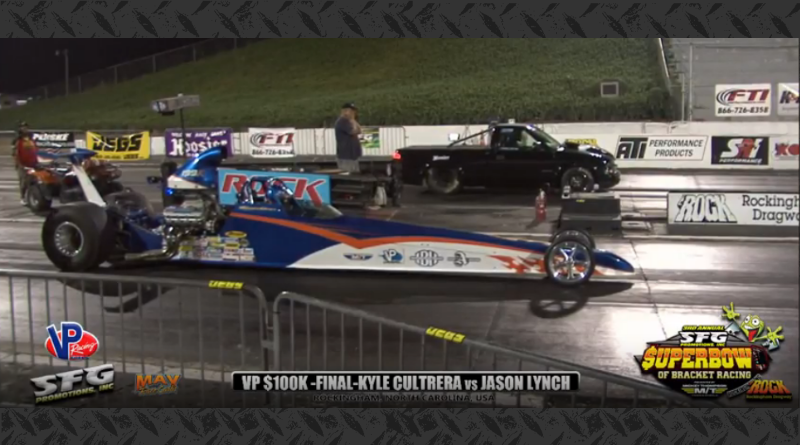 With $100K on the line in the final round, Jason “Catfish” Lynch took control of the race taking a .018 to .042 advantage at the tree over Cultrera. At the stripe, “Catfish” finished it off in style posting a dead-on 5.920 against his 5.92 dial after taking .030 at the stripe. Cultrera also ran dead-on his dial posting a losing 4.626 on his 4.62 dial. The big dollar payouts continue on Sunday as the SFG guys have the final $100K to win race of the weekend on tap. Expect another huge turnout on Sunday as racers compete for some of the largest payouts of the year at the Rock! For more results from the SFG Super Bowl of Drag Racing, click on the following links Wednesday $10K results, Thursday $20K results, and Friday $100K results. Visit DragChamp daily for the latest big money bracket racing news online from the SFG Super Bowl of Drag Racing at Rockingham Dragway.